Built on a cliffside, the iconic monastery is an architectural marvel. Legend has it that the Guru Rinpoche traveled here 1,300 years ago on the back of a flying tigress to convert the Bhutanese people to Buddhism. While the structure itself clings to the mountain face, the path up is very accessible with many spots along the way to catch your breath and take in the stunning views. Explore the Tiger’s Nest Monastery on our Druk Path trip! Prosperity of the country is measured in collective happiness rather than only gross domestic product. The term was introduced by King Jigme Singye Wangchuck, in 1972 when he declared, “Gross National Happiness is more important than Gross Domestic Product.” The concept of gross national happiness implies that all aspects of well-being be monitored rather than just economic prosperity. This includes monitoring psychological health, education, ecological diversity, and living standards. Bhutan has found that when they take an interest in their citizens’ happiness, employment rises and so does their GDP. What comes along with happiness? Preservation of culture, promoting sustainable economic practices, and protecting the environment–in fact it’s law that 60% of the population live under tree cover. Speaking of Bhutan’s love of trees, they broke the world record for most trees planted in an hour with 50,000 trees in 2015. Stepping off the plane in Bhutan you can instantly notice the pristine air that you’re breathing into your lungs. Bhutan is the world’s only carbon-negative country meaning they expel more carbon than they create. This is true not only due to their massive amounts of forest area, but the country also only began developing roads in the 1960s and were very late in adopting cars. Thimpu is home to one of the largest statues of Buddha. Gilded in gold, the monument towers over the city and is visible from the surrounding mountains. As well as the Buddha Dordenma statue are multiple dzongs. These are beautiful fortresses that are used as government buildings, housing for monks, and the setting for religious holidays. Exploring the dzongs you will find traditional buddhist art, bright purple jacaranda trees, and panoramic views of encompassing valleys. Bhutan claims archery as their national sport. However, it’s played in a much different manner than you may have seen seen in typical competitions such as the Olympics. 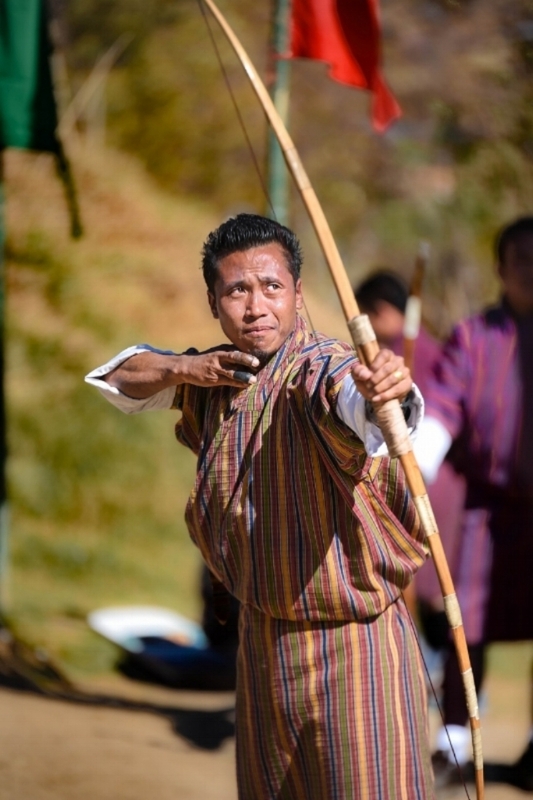 Archery in Bhutan is looked at as a social celebration of their country's origin. The sport is more than just shooting an arrow at a target, there are designated singers and dancers to taunt the other teams and cheer on their own. Along with the sport of course comes plenty of eating and drinking, as all family members participate. Bhutan’s spectacular mountain views look even better from up close. Trek high in the Himalayas, exploring temples and markets as you soak in every bit of Bhutanese culture. Before ascending into the clouds, you’ll come across dzongs nestled in forests and up on cliff sides. Whether way up high or down low, the unique culture is visible at all times from the trail. Ready to see and experience Bhutan for yourself? 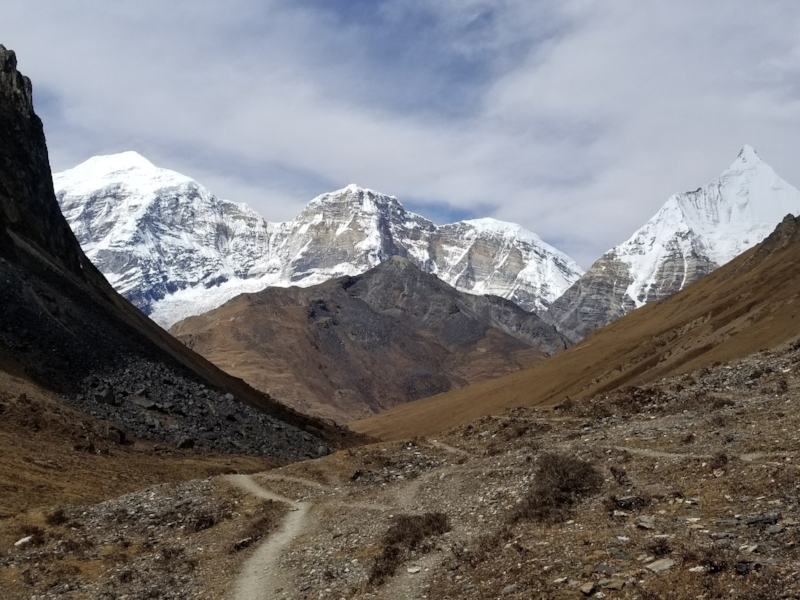 Explore the Sacred Chomolhari trail or go on a Druk Path expedition to get your fill of trekking, culture, and adventure.